The work is divided into three parts: (1) Bibliography of books, bulletins and articles regarding to any lake or pond. 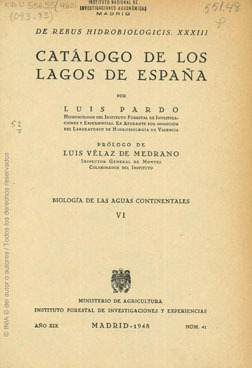 (2) Catalogue of the lacustrian masses, classified according to categories, with the regional terms in case they exist, stating in a card briefly the province, situation, characteristics and morphometry and, if existing, synonimy, biology, fishing and hunting, other applications and folklore. (3) The geographic distribution of lakes and ponds is given. Following the name of each province, the number of lacustrian masses existing in each of them is mentioned. Physical Description : 522 p; 17x24; il.